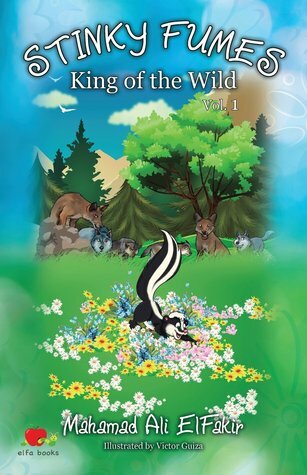 Review:Stinky Fumes: King of the Wild, Vol. 1 by:Mahamad Ali ElFakir | A Simple Life,really?! IT’S PARTY TIME-COME JOIN THE WILD ADVENTURE! Pepper the skunk is looking forward to the annual meet and greet party, where every skunk in the forest gathers to watch the new skunks spray for the first time. Pepper is ready to show off his first spray in front of everyone-but things don’t exactly go as planned! Pepper is embarrassed and upset to discover that he is different from all the other skunks. He worries that this means he is not a true skunk, but when his friends and family are faced with the threat of coyotes, Pepper realizes that being different can actually be a great thing. Join Pepper in his heroic adventure to try to save the skunks of the forest from coyotes. Will his differences help him or cause him to lose the battle? Find out in Stinky Fumes-a fun-loving and exciting adventure that reminds us how unique and wonderful we all are. All of us wanted to be “liked” and accepted, but many times we are rejected by our peers and so called friends. That is why I believe we are given families so that we have some people that are for us and are in our corner. In life we need some amount of adoration, I believe. In Stinky Fumes:King of the Wild, Vol. 1, Pepper the skunk is made painfully aware of the fact that he is different and all the other skunks make him feel very bad about himself. But his brother Tiger and Hopper try to get him to understand that we all have a purpose and the other skunks can NEVER change that in him. As Pepper starts to see things their way he heads back to the meet & greet and soon everyone sees the need that only “Stinky” can provide.